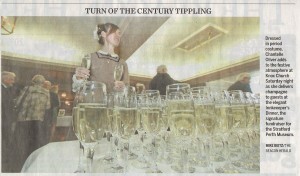 Really nice picture by Mike Beitz in The Beacon Herald of our sold out Innkeepers’ Dinner on Saturday night. Every guest at Innkeepers got a glass of champagne, courtesy of Denis Flanagan and Gallo Wines. A big thanks to chef Andrew Tutt and the legion of volunteers. In additon, thanks to The Beacon Herald for their gifts in kind and to Dave Jacobs, our auctioneer, and our spotters Martin Ritsma and Brent Shackleton, who brought in great money on our live auction.